There are many our friends or clients asked us questions about aluminum foam, which reflects that people pay more attention to this kind of new material. Now we sort out some representative questions to share with you. Q1: What advantages that aluminum foam has? Aluminum foam obviously has many advantages, such as small density, high absorption and impact resistance, high temperature resistance, strong fire resistance, corrosion resistance, sound insulation, low thermal conductivity, high electromagnetic shielding, and strong weather resistance. It also has filtering ability, with easy processing, easy installation, and high forming precision. Aluminum foam material has light, fatigue resistance, reduce vibration, specific strength, highly rigidity characteristics. Q2: What kind of applications for aluminum foam? The above-mentioned features enable aluminum foam to qualify for specific requirements within automotive, aviation, railway and engine building industry. It is also qualifying for other high potential applications in the field of architecture and design where electromagnetic shielding, structural damping, flame resistance, and a decorative surface structure are required. Q3：What are the main fields of aluminum foam’s application? The current study of aluminum foam is focused on mechanical, the normal insulation, acoustic, electro-magnetic shielding, decoration and etc. It is proved that aluminum foam is an excellent absorber, heat flame-retardant materials, acoustic noise reduction materials, and electro-magnetic shielding material, so the aluminum foam can be used as a good material widely used in the production and construction. Q4：Compared with other foam metals, what are the unique features of aluminum foam adapted to China Railway High-speed train? Aluminum foam is a new type of structural and functional integration of materials, it has a good energy absorption, insulation, noise, electromagnetic shielding and many other features, widely used in automotive, construction, aerospace and other fields. At the same time, the application of foam aluminum material requires the support of post-processing technology, rolling process is one of them. Q5: There are already some widely used acoustic materials, such as glass wool, asbestos, then why should choose Aluminum foam? 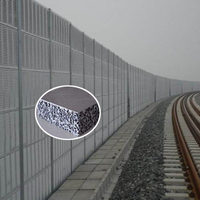 Compared with the materials widely used for sound absorbing such as glass wool, asbestos, the new material---aluminum foam is characterized with high bending strength, self-supporting, high temperature resistance, innocuity, low moisture absorption. These advantages above make its vital role in sound proofing with space development.